Migrating your iTunes library (apps and all) is a simple matter of dragging the contents of your old iTunes folder to your new partition. In Part 5 of my series on how to migrate to Windows 7 a little bit at a time, you learned a simple way to sync your Firefox and/or Internet Explorer bookmarks. Today, let's take an even bigger step: copying your iTunes library. This is literally a drag-and-drop procedure, though it may take a little time. Start by making sure you're running the latest version of iTunes in your original version of Windows (XP or Vista). Then boot Windows 7 and install that same version. Any mixing and matching of old/new iTunes library files could lead to unpleasant results. Browse into the Computer section, find your original Windows XP/Vista partition (on my system it was Drive D:, even though it appears as Drive C: when I boot to that partition), then navigate into the Users, Your Username, My Music, iTunes folder. You should see various iTunes Library files and sub-folders. 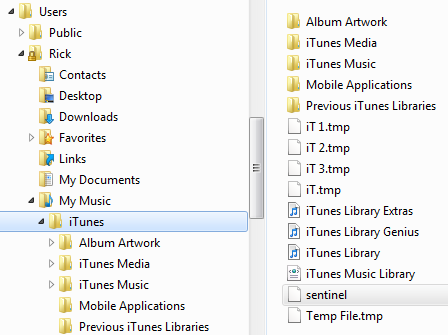 Now, find the corresponding iTunes folder in your Windows 7 partition, but don't actually open it. Instead, select all the files and folders from within the original partition's iTunes folder, then drag them to the new partition's iTunes folder. Depending on how much music, video, apps, and the like you have, the copy process could take anywhere from a few minutes to an hour or more. Along the way, Windows will likely notify you of a few duplicate files. Make sure to select the Copy and Replace option, as you want to overwrite the newer (and mostly empty) iTunes files with the ones from your original installation.